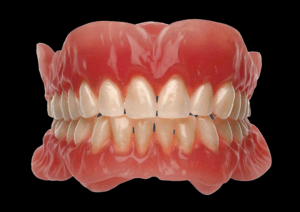 Removable dentures are appliances commonly worn to replace missing teeth and surrounding tissues. They can be classified as complete dentures or partial dentures. Both have bases, which can be made with acrylic or metal. The denture teeth are usually made of acrylic. Dentures are usually removed before going to bed each night. Dentures also require regular maintenance and should be cleaned using a soft toothbrush or denture paste to remove food debris and plaque. Used for replacement of all-natural teeth removed across both upper and lower jaws or either one jaw. Immediate – dentures fabricated in advance prior to teeth being extracted and delivered once extraction has taken place so that patient does not have to be without teeth during the healing period. However immediate dentures usually do not fit as well and require more adjustments. They also require a reline 3 months after delivery. 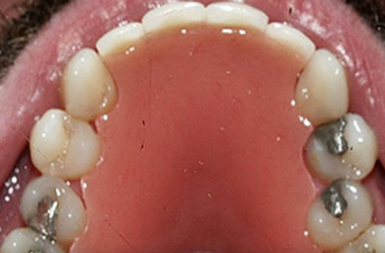 Gaps left by one of more missing teeth are replaced by acrylic false teeth present on a partial denture. 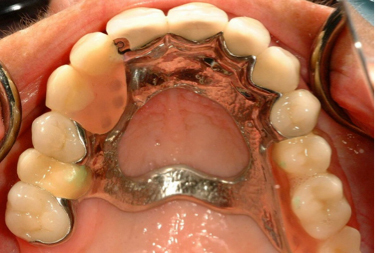 These partial dentures clip on to your natural teeth through metal clasps that securely hold the denture in your mouth.